An abundance of snow in many areas typically means continually low temperatures for several months. Despite the colder weather, there are several types of fruit trees that are tolerant of freezing temperatures. Winter weather is usually considered harmful to trees and plants, but in actuality, fruit trees often rely on cooler weather in order to ensure proper bloom time and fruit production. Peach trees are very hardy and can tolerant cold temperatures to lows of minus 12 F. Proper preparation of the tree prior to planting is crucial to its success in lower temperatures. Trees that have been cropped too severely or have gone into dormancy later than normal will be more at risk to winter weather. These deciduous trees lose their leaves in the fall and soon after enter a rest period. They are particularly suited to colder weather conditions because in order to leave the resting period, they require a certain number of chilling hours. Chilling hours are necessary for proper blooms and growth, and takes place in temperatures between 32 F to 50 F. Depending on the variety, the required number of chilling hours ranges from as little as 200 to over 1,000, according to North Carolina State University. Hardy in USDA planting zones 5 to 9, peach trees grow best in loose, well-drained soil. As with many hardy fruit trees, sour cherry trees need a certain amount of colder weather to end their resting period. If it is a warm winter, the tree's growth in the spring may be late. Whereas sweet cherry trees are vulnerable to the cold, winter weather does not endanger sour cherry trees. Exposed buds can tolerate temperatures as low as 24 F, according to Washington State University. Sour cherry trees do best in moist, well-drained soil. They do not tolerate standing moisture around the roots, which can lead to root rot. During the tree's fruit producing period, it is best if the tree is kept as dry as possible, as this encourages more cherries with less rotting of the fruit. Unlike sweet cherry trees, sour cherry trees are self-fertilizing and do not require a nearby tree for pollination. Sour cherry trees are hardy in USDA planting zones 4 to 9. Apple trees are one of the most cold-hardy fruit species. They are able to survive in temperatures from 28 F to minus 60 F, according to New Mexico State University. Cool temperatures in the fall encourage cold tolerance. The majority of apples tree varieties require between 400 to 1,000 hours of chill time at a temperature of 45 F or below, according to Central Coast Gardening. Apple trees are unable to self-pollinate, and they cannot pollinate flowers from a tree of the same species. It is necessary to plant at least two different varieties of apple trees near each other to encourage proper pollination. Flowering crab-apple trees can also be used for a source of pollination. Apple trees require full sun with six hours of sunlight per day and flourish in rich, well-drained soil. They are unable to tolerate standing water at the roots. 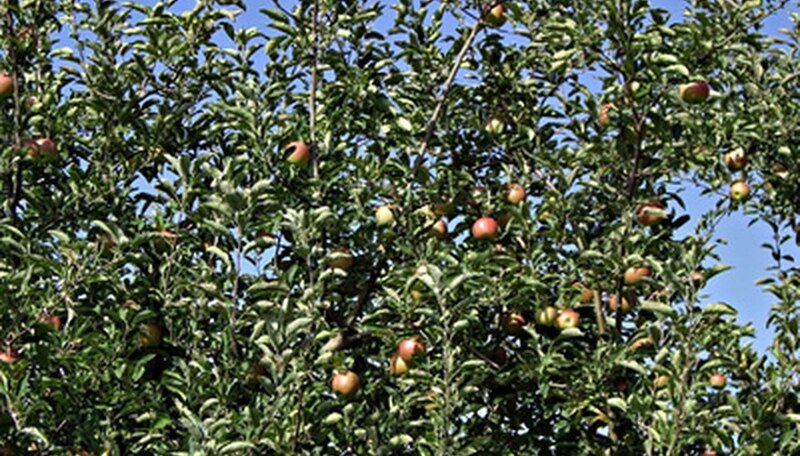 Apple trees are hardy to USDA planting zones 4 to 8.